The story, as it has been passed down through the family generation after generation, has it that in the early 1870′s, Jess Hoffman made the very first bar of Grandpa’s Pine Tar Soap from his own recipe on his family farm, located in Tippecanoe, Ohio. During an era of innovation, this family recipe was proclaimed for its restorative and cleansing benefits. 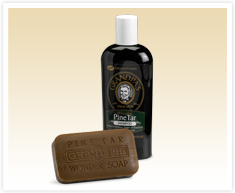 As Grandpa’s Pine Tar Soap continued to earn praise and popularity, Grandpa went back into the kitchen and created more specialty soaps for different purposes. Today, there is a whole line of soaps that have been thoughtfully crafted. We are confident that you will enjoy his products as generations have since the first batch was sold in 1878.